Hands on: Sony Xperia Tablet Z review | What Hi-Fi? UPDATE: We're putting the finishing touches to our full review but in the mean time you can read our hands-on first impressions. Sony has confirmed its new tablet, the Xperia Tablet Z, will be headed for UK shores, with a release date expected some time in May. The Sony Tablet Z packs a 10.1-inch display, but has dropped the ‘folded magazine’ design of the Xperia Tablet S, instead opting for a similar straight-edged design to the Xperia Z smartphone. It also borrows the same polyamide ‘skeleton structure’ running around the edge to make it more durable against knocks and drops. Also like its smartphone sibling, it has a seriously slim body. At 6.9mm it’s the world’s thinnest 10-inch tablet, but even out-skinnies the smaller iPad mini. At 495g, it’s the world’s lightest 10-inch LTE tablet available too. This is helped by the back being covered in a soft-touch glass fibre, making for a light but durable tablet. It’s perhaps not as premium feeling as something like a heavier iPad, but to those who put portability at the top of their must-haves, this tablet is certainly one to consider. Waterproof and dustproof smarts are on board too, so it’ll survive situations from the beach to the bath, allowing up to 30 minutes underwater. As for buttons, you'll find a lock button, volume rocker and covered headphone port on the left hand-side, when held in landscape mode. On the bottom is the microUSB charging port and the microSD card slot. Sony tells us the Xperia Tablet Z will be available in white or black and both LTE and Wi-Fi only versions. The 10.1-inch HD WUXGA screen looks gorgeous when viewing content, with its 1920 x 1200 resolution powered by the Mobile BRAVIA Engine 2 for improved colour reproduction. In fact, even though the resolution isn’t as good and pixels per inch are down compared to the likes of the iPad (224 vs 326), Sony says that the Xperia Tablet Z offers 20% better colour reproduction than Apple’s tablet. While we’re yet to do a side-to-side comparison, we can say that the colours were bright, sharp and vivid. Viewing angles are also improved to those on the Xperia Z, though we did find it to be pretty reflective under the bright lights of the Sony stand. The Sony Xperia Tablet Z is the first tablet to pack Qualcomm’s 1.5GHz quad-core Snapdragon S4 pro processor. We found the tablet to be easy to navigate, with no sense of delay or lag when flicking through menus, zooming in and out or opening apps. Storage possibilities depend on your choice of device – the Wi-Fi only version is available in 16GB and 32GB versions, with the capability to get up to an extra 64GB of storage via microSD card. On the other hand, the LTE version will be available in 16GB only, accepting a microSD card up to 32GB. As we’ve seen in the Xperia Z, and across Sony products, NFC and One-touch sharing is a big emphasis right now. The Tablet Z, therefore, of course comes with NFC built in, meaning you can connect to other Sony products – be that a TV, portable speaker or pair of wireless headphones – with a simple touch. Being a Sony product, sound has been pushed as a big part of the Xperia Tablet Z. The layout of the ‘speaker halls’ on left and right corners ensure that whichever way you hold it, you get a clear sound from the two in-built speakers. As is the case with trade shows, it was very loud when we had our hands-on time, so we’ll withhold judgement on the quality of sound until we do our full review – but it did sound good, and if the sound performance of the Xperia Z smartphone is anything to go by, we hold out high hopes. While we can’t say a camera is not the top of our concerns in a tablet, the Xperia Tablet Z does have something to shout about, with an 8MP main camera, as well as a 2MP HD front-facing camera. If you do use it to take the odd snap, the camera reproduces colours well, and offers features including a 10fps burst mode, sweep panorama and a whole host of artsy effects. The battery in the Xperia Z is 6000mAh – so 50% smaller than the battery you’ll find in the Google Nexus 10, for example. While we obviously can’t comment on how it will perform, Sony is pushing its Battery STAMINA mode that will ultimately turn off all the functions it can when it’s not being used, and in doing so, preserving juice where possible. Of course, we’ve seen it waterproof-tested into a bowl of water and the Tablet Z works perfectly well when wet, without even needing to be dried before using it. The Xperia Tablet Z is an extension of the excellent Xperia Z smartphone, which is obviously to its credit, and there's a lot about this tablet that we like. We’re certainly looking forward to getting our hands on a full review sample to really put it through its paces. The Xperia Tablet Z price could be a deal-breaker: set to be £399 for the WiFi only model and £499 for the 4G LTE version. 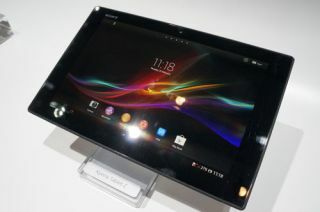 The new Sony tablet is set to be released running Android 4.1, upgradeable to Android 4.2 after launch.